Neighbour’s Alarm Driving You Crazy? Resolving noise pollution while preserving neighbour relations! Faulty burglar alarms going off in your neighbourhood at all times of the day are annoying to say the least. By necessity, the noise is piercing and intrusive, but if it’s a false alarm or happening repeatedly it can become a real problem. You might find that there’s a pattern to these activations, such as when there’s a power cut which usually indicates that the battery is dead, or at certain times of the day. Most alarms are limited to sounding for a maximum of 20 minutes at a time but this can still seem like a very long time if you’re having to listen to it – especially at night. Noise is not the only issue. Every faulting alarm dilutes the effectiveness of a genuine alarm activation as nobody takes it seriously. So, what do you do? You can report noise pollution to your council if it is deemed to be unreasonable. The factors they will consider to determine whether it’s unreasonable are time of day (between 11pm and 7am is considered particularly unsociable), volume, frequency and source of the noise and the ability for the sound to be controlled. To be a nuisance, noise must be causing substantial and unreasonable interference in your home on a regular basis. This, however, is a last resort. It’s never desirable to be on poor terms with your neighbours so the first course of action should always be to speak to the neighbour in question and make them aware of the issue. It may well be that the alarm is faulting when they’re out and they don’t realise it’s happening or that they’re just not aware of how much of a nuisance it’s causing. When you’re dealing with people over a problem, in a situation that has the potential to be difficult, it often pans out better if you can also help to offer a solution. Yes, it’s technically their problem but it’s in both your interests to get it sorted. Often when people have an issue with their alarm they put off getting it fixed because they perceive it to be expensive. That’s not necessarily the case, as many issues and faults can be sorted with a general service and/or a new battery. We charge £68 + VAT for a full service so it’s not as expensive as they might think and definitely not worth falling out with the neighbours over. To help you demonstrate this solution to the offending neighbour we’ve put together a little flyer that we think will help. Giving them this as part of a calm and reasonable conversation should hopefully allow them to understand how significant the problem is, how simple the solution is and how it can all be settled while preserving neighbourly harmony!! 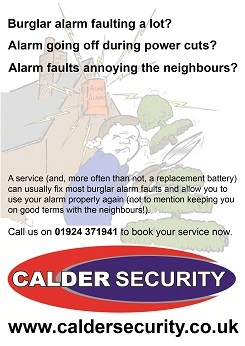 The flyer is available here to print or e-mail as a PDF or you can pass on our number – 0345 833 5543.
previous Does an alarm need to be working to be a deterrent?